Com Lam – Central Highlands of Vietnam offers visitors not just discovering spectacular sceneries but also eating and drinking like a mountain dweller. The Central Highlands ofVietnamis a tourist hot spot, attracting many locals and foreigners every year. It has unmatched vistas like the dreamy mountainous streets, rugged terrain, howling winds, foggy towns, and night markets. It is home to a variety of ethnic groups, lush forests, and an abundance of wildlife. Da Lat, Buon Ma Thuot, and Pleiku are three famous towns here that are always crowded with vacationing visitors. Travelers love theCentral Highlandsand these towns not just because of the spectacular scenery but also the opportunity to discover ethnic lifestyles and customs and unusual delicacies. 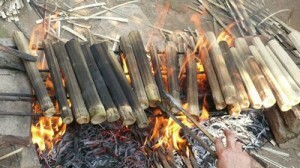 If visiting the Central Highlands, you should try cơm lam (rice cooked in bamboo stems) and grilled chicken. It is a fascinating experience to eat the rice and chicken by dipping it in sesame and salt and drink rượu cần (a beer-like drink sipped through a long bamboo pipe from a jar) like the mountain people do. Cơm lam has its origins in the mountainous lifestyle when tribesmen made long journeys through the forest to work on mountain fields. They would prepare for a trip by stuffing wet rice into bamboo tubes, putting them in a cloth bag, and taking them along. It may sound simple but its preparation and cooking are complicated. People have to choose bamboo stems of a suitable age at first. They should be fresh and young in order for them to imbue a unique mountain fragrance to the rice. In order to make delicious cơm lam, one needs to use the glutinous rice variety grown on the mountains. Wash the rice, soak it in water for several hours, and take it out and add a little salt. Put the rice in the bamboo stem, add some water, and tightly seal both ends with banana leaves. There are several ways to cook the rice, including steaming and grilling for 45-60 minutes until the rice is done.